Tellurium atoms have 52 electrons and the shell structure is 2.8.18.18.6. 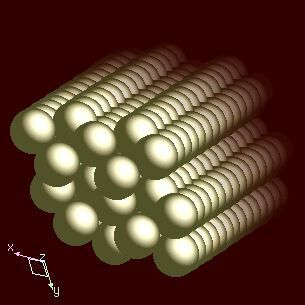 The ground state electronic configuration of neutral tellurium is [Kr].4d10.5s2.5p4 and the term symbol of tellurium is 3P2. Tellurium: description Your user agent does not support the HTML5 Audio element. Crystalline tellurium has a silvery-white appearance, and exhibits a metallic lustre when pure (see above). It is brittle and easily pulverised. 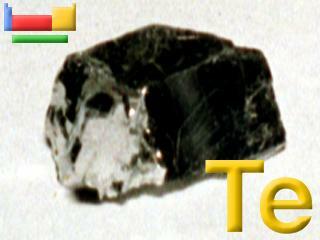 Tellurium is a p-type semiconductor, and shows varying conductivity with crystal alignment. Its conductivity increases slightly with exposure to light. It can be doped with silver, copper, gold, tin, or other elements. Humans exposed to as little as 0.01 mg m-3 in air, or less, develop "tellurium breath", which has a garlic-like odour. The solid state structure of tellurium is: bcc (body-centred cubic). Tellurium has no biological role. All tellurium compounds are highly toxic. Reactions of tellurium as the element with air, water, halogens, acids, and bases where known. Binary compounds with halogens (known as halides), oxygen (known as oxides), hydrogen (known as hydrides), and other compounds of tellurium where known. Bond strengths; lattice energies of tellurium halides, hydrides, oxides (where known); and reduction potentials where known. Tellurium was discovered by Franz Joseph Muller von Reichstein in 1783 at Romania. Origin of name: from the Latin word "tellus" meaning "earth". 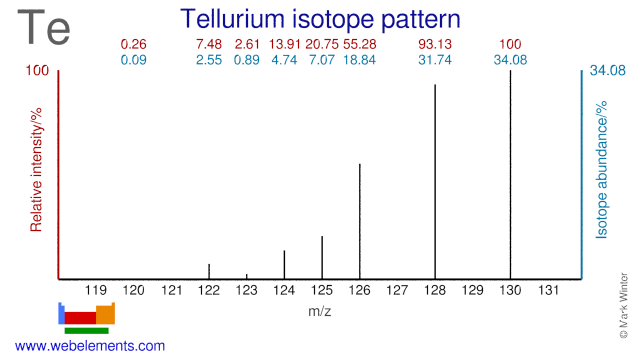 Isotope abundances of tellurium with the most intense signal set to 100%. Tellurium has eight stable isotopes (Te-120 and Te-123 are usually considered stable because of their long half lives) and many of them have a medical application. Te-120 is used for the production of I-120g which has an application as a PET and Beta emitting isotope. Te-122 is used in the production of the radioisotope I-122 which is used in gamma imaging. Te-123 is used for the production of radioactive I-123 which is used in thyroid imaging. Te-124 is used for the production of both I-123 and the PET isotope I-124. Finally, Te-130 is used in the research into double Beta decay. Isolation: it is not usually necessary to make tellurium in the laboratory as it is commercially available. While there are some tellurium ores, most tellurium is made as a byproduct of copper refining. Extraction is complex since the method emplyed will depend upon what other compounds or elements are present. The first step usually involves an oxidation in the presence of sodium carbonate (soda ash). The tellurite Na2TeO3 is acidified with sulphuric acid and the tellurium precipitates out as the dioxide (leaving and selenous acid, H2SeO3, in solution). Tellurium is liberated from the dioxide by dissolving in sodium hydroxide, NaOH, and electroytic reduction.